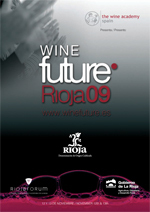 The Wine Future Rioja 09 conference was held here on November 12 and 13. Organized by Pancho Campo, Spain’s first Master of Wine, the event was touted as the most important gathering of luminaries in the wine business. The cost was steep, about $1,500 for the two-day event, including a megatasting given by Robert Parker, arguably the world’s most influential wine writer. Initially I was going to pass because of the price but finally I was able to attend, thanks to a complimentary invitation from one of the sponsors, Marqués de Riscal, whose finance director Fernando Salamero was my boss for 15 years while I was the director of the Rioja Exporters’ Association. When I saw the list of speakers I was a little disappointed, because most of them were my age or older, which didn’t seem to jive with the idea of the future of our industry. Having said that, I especially enjoyed the presentations about social media (Ryan Opaz, Gary Vaynerchuk and Jeremy Benson), Miguel Torres’ talk about climate change and what Torres is doing about it, Robert Joseph’s thought-provoking talk about making wine easier to understand, Tim Hanni’s presentation about taste perceptions and Nicola Jenkin’s talk about packaging. We tasted 20 wines (18 garnachas and two Riojas). When the wines were announced in the program,there was a big fuss in Rioja about the absence of any Riojas and consequently, two were included at the last minute. Parker defended himself by saying that he wanted to focus on the widespread international use of garnacha rather than on tempranillo, mainly used in Spain. In addition, he stated emphatically that he didn’t want to give the impression that he was sacrificing his independence by promoting the wines in the region hosting the conference. Fair enough, but this explanation wasn’t well received by the locals because of the increasing range of garnachas from Rioja available here. They weren’t, however, known by Mr. Parker, leading me to believe that their international distribution is weak (Garnacha producers from Rioja take note!). Before the tasting, I, like most people, expected a symphony of overripe, overoaked, high alcohol fruit bombs, but was very pleasantly surprised, especially by the seven Châteauneuf-du-Papes, none of which had seen any oak at all. All of them were really elegant and showed both the place they were from and the characteristics of the garnacha grape. The 1945 Marqués de Riscal was superb. I also liked the Clos Erasmus from Priorat (not at all inky and inscrutable), Espectacle from Montsant, the Clarendon Hills Old Vines and the Killakanoon from Australia. On the down side, I didn’t think the Contador (from Benjamín Romeo in Rioja) was ready to drink yet and the Aquilón and Atteca Armas (both from the neighboring region of Aragón and sold by the Spanish specialist importer Jorge Ordóñez) had too much new oak , obliterating the fruit, for my taste. I was also fortunate to help a local journalist with his interview with Parker. In the interview he defended himself from his detractors by saying that he had an eclectic palate and that he was displeased with two of the wines in the tasting because they were overoaked! He came across as a passionate, sincere, fiercely independent guy , which I liked. I enjoyed the event because of the social media presentations, the networking oportunities it gave me and chatting the other speakers, most of them old friends. However, next time, I hope distribution and social networks are at the top of the agenda!